The lowest possible value is now 50K. There are countries (like the Netherlands) where this is very high (for comparison: I'm on the high end of middle class and I make <30k a year pre-tax). 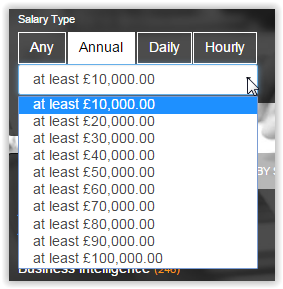 There should at least be options for 40k 30k and 20k, maybe even 15k. We're working on an update that'll allow you input a custom value. This is going through QA now, but you should see it live soon. I'd say this should be moved to £/$/20K as a minimum. Unless you only plan on advertising mid-to-high end jobs? Outside of London (which is a special case) I'd be surprised to see anything but a very senior job over £50K. Basically as it stands this filter is unusable for me. add just the 50K filter and this drops to 260! So 87% of the UK jobs fall outside of the minimum wage of the filter! I disagree. The job market for developers in the Netherlands has been improving, so these 2014 figures are outdated. Still, we see that about 55% of respondents makes over 40K. That study is likely biased towards younger developers, given its source. This is reinforced by reports of below-minimum wage incomes, which implies internships. But even if the figures were real, it's questionable whether we even want companies who pay (significantly) below market. If a Dutch company can't afford to pay 50K+benefits, StackOverflow might not be the right place to look for new employees. It seems that there's some disagreement about this. The Dutch labor market for developers is highly favorable to them - demand is quite high, supply is low. Sure, there are quite a few companies who are unhappy with this, and would prefer to pay less. That is why they're advertising! They've got open positions precisely because they lose developers to better-paying companies. The current advertisers are not a representative sample. Not the answer you're looking for? Browse other questions tagged discussion feature-request status-completed jobs search . Can we get Franz Kafka out of the review queues? Is there something wrong with promising bounties on my own question?